Visually design your packages in minutes! The interface is divided into several steps to provide a logical navigation between the lot of features provided by Paquet Builder. 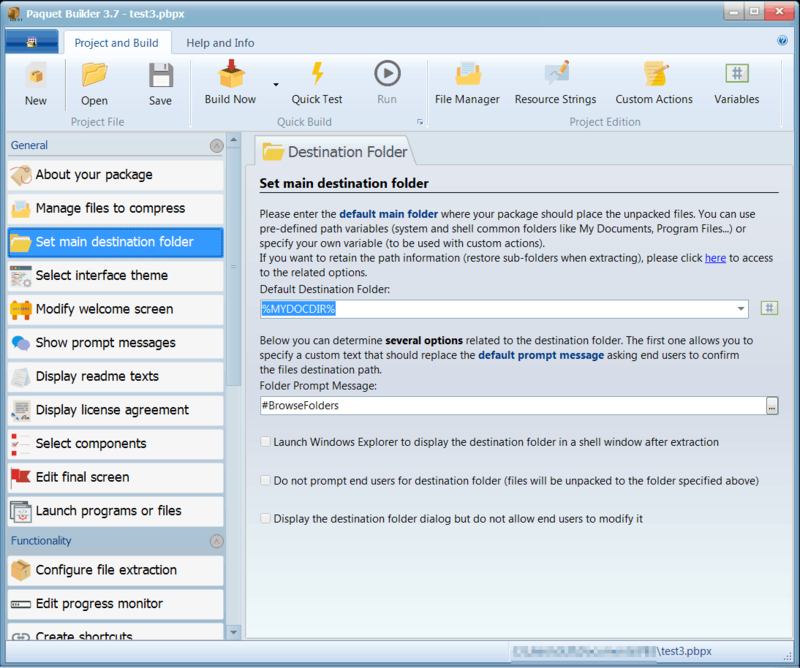 Directly package your files, folders from Windows™ Explorer, or even convert existing 7zip archives (.7z) into Self-Extracting .exe files with Paquet Builder's shell extension (available as a free add-on). Support for multiple command switches. You can open and compile your projects from Windows Explorer or command line (also support for silent builds). Support for compilation directives for easy automation: you can create text-based packages skeletons and run Paquet Builder silently to build your packages. Directly build Self-Extracting packages from your applications! Use the console command-line compiler of Paquet Builder in process automations, automatic distribution cycles, cron tasks, etc. Compile projects and installers without invoking the GUI. Paquet Builder shows you a full summary after having compiled your package. You can optionally save this log to an external file. It can also automatically execute your package after build. Ability to cancel the compilation when building packages. Environment options: define your own preferences for your packages, keep Paquet Builder updated with the Web Update tool. Includes a context sensitive help system. Just press F1 to get extensive help about the feature you are working on. Small sizes: overhead is less than 256kb (small enough regarding all features and some other Self-Extractors). Compatible with all Windows versions starting from Windows XP to Windows 10.1. Works on x86 and x64 editions of Windows.